Time to bust out those sombreros, ponchos and indulge in some tacos when you trip on the Mexican Mushroom pack. Found in the wild of the subtropical regions of Mexico, this Mexican truffle strain has been founded in the late 1950’s and has been a hit ever since. Get ready to get psychopilisophical and ponder all of life’s mysterious questions while feeling an energetic, light sensation overtake your body. “Flesh of the Gods” Truffle. This type of truffle is one of the most well known and well used. Don’t know where to start? Start with the subtropical Mexican truffle. Perfect for Beginner and Novice Truffle Users. Because the effects are so positive and are less intense than some of the other types of truffles, this is the perfect beginner magic truffle. Upbeat and Positive Trip. Truffle trips can be variable and intense; with the Mexicana, you know it’s going to be a happy, positive experience. Get lifted with the Mexicana! Exciting and Philosophical Simultaneously. Experience both energetic and happy sensation while having your brain stimulated with deep philosophical thought. Cost Effective for a High Quality and Affordable Experience. 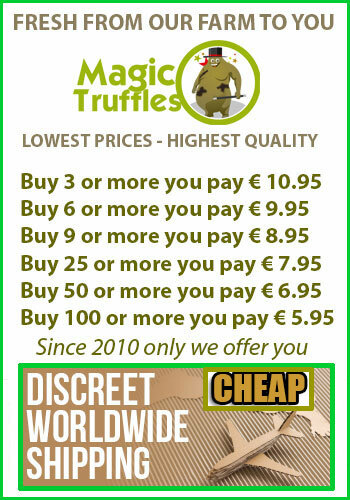 We product top quality truffles at unbeatable prices for all of our valued customers. Stride through sandy white beaches and get a taste of the tropical lifestyle when you indulge in the Mexicana truffle pack. Get ready for hours of positivity and a new mindset. Order now! My order came within two weeks. This was the first time I had ever ingested truffles. I was pleasantly surprised after take 5 grams at a time how my mood shifted to a positive and euphoric feel. Something tells me this won't be my last experience with truffles. I'm very curious to try the others, and Mexicana was a great jump off point. My girlfriend and I decided to stay home and try them. The trip was awesome, especially for the philosophycal part. It didn't hit us too strongly, but I guess it was because we had had a late lunch although we waited for about four hours. The visuals were good, but thinking about life and the universe was much more interesting. We'll try the atlantis next time.